On the defender’s side, there’s skill, a defense roll, and the ST rating of the weapon itself. A super-strong creature wielding a rock is going to hit really hard. A moderately strong person smacking you with a mace or halberd is also going to hit very hard. That suggests to me that the damage roll sufficiently amalgamates those two together to stand as a proxy for such things in most cases. So on the attack, knocking a weapon away, striking to damage a weapon, and a beat can all be resolved with an attack, and if successful, a damage roll. Skill should probably matter. Your own weapon mass should matter. Your own ST should matter for beats and getting a weapon knocked away, but not for the weapon being damaged. Note that I’m not going to deal much with striking to damage. That seems fine in principle if perhaps a bit undefined: strike the weapon, if you hit, roll damage, subtract weapon DR (usually 4 for hafted weapons and 6 for steel), and check damage to objects rules p. B483-485, especially the box on p. B485. ‘Nuff said. For now. The rules for beats presently can be found in GURPS Martial Arts, pp. 100-101. In it, a Beat is a variant of a Feint, but can only be done if you meet certain conditions (for example, to beat your foe’s sword out of their hands this turn, you must have attacked your foe, and he parried with his sword, on your last turn). The Beat is resolved as a quick contest of ST or DX-based weapon skill. As it’s a type of Feint, you get penalized 1-for-1. So you’ve got about a 50% chance of a Beat working or not for equal combatants, and we’ll want to preserve that. But to qualify for a Beat at all, you’ll need that contact between weapon and defender’s shield or weapon. That’s probably can be simplifed as “someone made an active defense,” which is probably about a 50-50 proposition (for every hero out there with Skill-20 giving Parry-14 with Combat Reflexes, 15 with a retreat, and 17 with a medium shield, there will be rather more with Skill-10 and Parry-8 hoping to survive the next battle). In any case, you don’t want a modified Beat rule to produce a more-certain beat for equal combatants than around 20-50%, so that it becomes a better plan than attacking. That being said, in real sport fighting – fencing and kendo as personally experienced examples – a beat is a classic and frequent way to open a line of attack. In fact, it’s critical to do it, because otherwise you can’t even penetrate defenses. It is possible, however, that this sort of thing is below GURPS’ resolution, or (more likely) is the sort of thing subsumed into Deceptive Attack. On the attack, let’s take a ST 13, DX 11, Broadsword-12 (Parry-9; DX+1) swordsman. He’ll do 1d+1 thrust, and 2d swing, for 4-5 points for a thrust, and 7 on a swing. A broadsword in one hand has a MinST of 10. What would happen if we added MinST of the weapon to the ST of the user? For the same fighter battling his doppelganger, that would be ST 13 + ST 10 = ST 23. Look that up on the thrust table . . . and you get 2d, or 7 points. So even-Steven, and on a successful hit, you’ll have a 50% chance of . . . what? What if you try and parry with a main-gauche instead? ST 13 and ST 6 for the weapon is ST 19, or 2d-1. On the average, a thrust from the sword will be a half-point lower than this, but a swing will be a few points higher. That mostly tracks; against a rapier at ST 9 it’s a reasonable defense, but against a broadsword it’s overmatched by a few points. Remember – this is about a beat, not breakage. So if we assume that the knife won’t chip and shatter, with equal ST and skill then it’s basically a contest of weapon mass at a point of differential per two points of MinST difference (yeah, it’s just ST, but I’ve called it MinST since 3rd edition, and it’s a hard habit to break). So what do you do? I’m going to suggest on a successful beat the attacker rolls his damage if he hits the targeted weapon or shield. The defender gets to counter by rolling damage as well. If the attacker’s damage is higher than the defender’s, the difference is applied as a penalty to the defenses that lasts until the next turn of the beating fighter or the defender takes a Ready maneuver. I’ve been a bit vague at this point about the defender. I’m noodling. I’m thinking margin of success or failure on the defense adds directly to the damage roll to resist the beat. Yes, this means a deceptive attack can trade skill for “damage” at a 2:1 ratio, but then, you can do that with Deceptive Attack already, and Feints are 1:1. A critical success on the attack roll, and the damage roll is unopposed. A crit on the defense roll and beat is just spoiled, no matter what. Anything else, take the margin of success or failure for the parry and apply it to the damage roll to resist the beat. I’m thinking if you manage to do more beat damage than the defender’s ST for 2H weapons, half ST (round up) for 1H weapons, the weapon gets knocked out of your hands. Again, in the example, that’s 7 points for a 1H broadsword. If you have the disarming technique, go ahead and roll that when attacking. ST 18, DX 12, Polearm-18 with Dueling Halberd (ST 12, 3d+4 swing) on the attack. Broadsword guy above on the defense (ST 13, Broadsword-12 with ST 10 for 2d+1 to resist). Polearm will roll for Beat at 14, hitting 90% of the time. Broadsword will roll vs Parry-9, on the average failing by 1. On the average the penalty is about -7 . . . not only a huge penalty, but only one point less than what is needed to disarm. And for those keeping score at home, on hitting the blade, 1-16 points of damage will punch through the DR 6 of the steel sword, which should be about 11-12 HP total. So while it might not start to fear disabling in one hit it will certainly be disabled in two. Note the same math will hold for a ST 23 ogre striking unarmed (more or less), including breakage (the optional rule to treat heavy limbs as if they were BL/20 instead of ST/10 helps here, treating ST 23 more like a 5.3-lb weapon than the 2.3 that the normal rule recommends. Note this is more threatening for breakage than RAW, too – the 5.3-lb ogre hand can never break the broadsword in either case, but is quite dangerous with the modified rules. ST 13, Broadsword-24 (Parry-15, 2d+2 to resist beats) vs ST 13, Broadsword-12 (Parry-9, 2d+1 to resist beats). Attacker throws an attack at the weapon, committed, so Skill-22, but takes -6 to his skill to impart -3 to parry. This drops the foe’s parry from Parry-10 to Parry-7 with a retreat. On the average, then, the skillful beater will impose -3 to defend on his foe. Note that an honest Feint here is -12 to defend via Quick Contest, and -6 from a straight deceptive attack. I call them Boromir Beats because that’s really, really what he was doing during the battle at Amon Hen. Two beats to knock aside the Uruk’s shields. So what about Shields. They’re heavy in the Basic Set . . . but with no ST rating. Even a pixie can wield a 15-lb Medium Shield, which should probably have about 20 HP (but the basic set lists 40). Giving the shield effectively ST 20 (equal to it’s HP) for the bashing role woudn’t be crazy-time. The 12-lb gada has ST 13, but while heavier, the shield has a much shorter reach and is not really optimized for striking. Calling a 15-lb shield ST 9 (so it’s just under 1xBL) wouldn’t be crazy, but that seems low for the purposes of beats. A 15-lb sword (doing some curve fitting) would be about ST 16, while an Axe would be ST 17 and a polearm for whatever reason would come in at about ST 14. If we want shields to be big bad beat machines, they’d contribute something like ST 18 to the mix. I like the symmetry of rolling an attack and damage for beats. Adding and precalculating the weapon’s ST rating to get a beat defense value is a one-time-before-play bit of math. The numbers produced aren’t crazy, and thus far are smaller than lopsided skill total Feints. I might have to try this one if I ever GM a fantasy game. Next Next post: Castle of Horrors: Running away is Cardio! Hmm. One thing about Beats, though, is that you really aren't trying to break the weapon. You care that it is out of line. It seems like you want to cover attacks against the weapon that just so happen to also knock it out of line – meaning an attempt to disarm by brute force or break a weapon that also makes it harder to defend (or attack, really.) I don't think they are the same thing – and saying there are "beats" which are really Deceptive Attacks so you don't have to deal with ST-based Feint is kind of odd. Suddenly we need to define non-contact vs. contact Deceptive Attacks. I think in this case you're assigning motivations to me that I don't have. I wasn't trying as my base case to avoid ST-based Feints. I was thinking of how I have used small beats in kendo (which are very, very quick taps to open up the line) vs. more extreme "slam the guy's weapon or shield aside, which I've seen best exemplified in the battle defending the Hobbits where that was Boromir's preferred technique. I like this resolved as an attack, not as a quick contest with pre-conditions, because frankly that's what it is. The best way would be having graded outcomes for Knocking a Weapon away – a mild success is a beat, solid makes it Unready (though that could just be the result of a high-enough penalty), extreme sends it flying. I tried to deliberately separate beats from breakage, not dealing with it in an integrated way, but only as an aside: by the way, a lot of this can threaten the weapon too. But this was not an attempt to eliminate ST-based contests. It was mainly what I said in the preamble Google+ text: 'hey, did I cover Beats in my article? No? Blog post!" Okay, maybe I'm misreading. But the execution seems to be as I wrote. 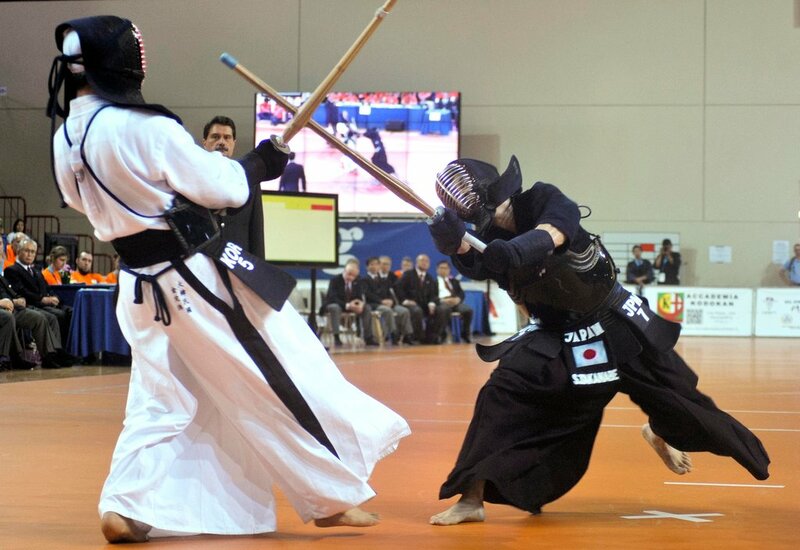 I do the same tap-beats in Kendo, but they're still beats. Take it as someone who helped write Beats into GURPS – those are included. So are contact arm-drags, so are punch-and-leans, etc. In a way, that's what helps explain swingy Feints and Beats – it's not always "you Feinted him so badly he's at -10!" it's also "You Feinted him and the combination of his reaction and your skill leaves an opportunity he is at -10 to cover." Skill mattters defensively because you don't over-correct as well as reduce the effect of the attempt. Again, I could be misreading it, but it sounds like you've only got half of that, and reduce the half I'd say could also be done as damage-based effect rolls to "the small beats that are Deceptive Attacks, not the big Boromir Beats" – see what I'm saying? If you want to get shield MinST in a consistent way, consider cranking then through the formula for Determining Weapon ST on pg. 15 of LTC2. I'd treat a buckler grip as 1 hand, strapping it to the arm as 1.5 hands, and a guige adds a second hand. Also, I like where these rules have gone and may toy with them a bit, since I have a fighter that relies heavily on shield bashes, slams, blocks, and shoves. It'd be interesting to see how this plays out in a game.